We’d love your help. Let us know what’s wrong with this preview of Slow Stitch by Claire Wellesley-Smith. To ask other readers questions about Slow Stitch, please sign up. This book is fantastic. Not only does it include further reading, it also includes many, many different artists. (It comes back to the author & her practice, but she efficiently weaves her own practice into the practices of others.) I actually found myself in these practices as well. For so long I've spoken about how I work with transient materials and how I value the memory in old fabric and repetitive processes, but I've never been able to find artists that synced up. Well, it turns out th This book is fantastic. Not only does it include further reading, it also includes many, many different artists. (It comes back to the author & her practice, but she efficiently weaves her own practice into the practices of others.) I actually found myself in these practices as well. For so long I've spoken about how I work with transient materials and how I value the memory in old fabric and repetitive processes, but I've never been able to find artists that synced up. Well, it turns out they exist and they're very articulate - describing things in ways I only wish I could. Why do people not understand that 'mindfulness' is merely (overused) marketing speak? I did not learn anything new from the book - it's all been printed before. And for me, art has to be something which moves me, which impacts my soul. None of the 'art' in this book came anywhere near that. I was disappointed. Cas Holmes book, Stitch Stories, tells the same story as this one but does it much better. Her art is often gentle and thought provoking. I probably would have given this book more stars except it seems very close to Jude Hall's blog Spirit Cloth. I love the idea of stitching as contemplative work, as well as reusing old fabrics, but I don't know what she does with the work pictured. It is neither finished nor presented, and if I stitch for hours, there needs to be something done with the work at the end. In this book the author applies the principles of the Slow Movement (already well known through the Slow Food Movement in particular) to textiles. She comes from a family of makers, having learned knitting and sewing from her mother and grandmother, and therefore to some extent already understood the value of quality over quantity and "doing everything as well as possible rather than as fast as possible”. Although she relates to the problems of our current pace of life, she acknowledges that we In this book the author applies the principles of the Slow Movement (already well known through the Slow Food Movement in particular) to textiles. She comes from a family of makers, having learned knitting and sewing from her mother and grandmother, and therefore to some extent already understood the value of quality over quantity and "doing everything as well as possible rather than as fast as possible”. Although she relates to the problems of our current pace of life, she acknowledges that we are not the first to think that life might be moving too quickly, and gives the example of the Arts and Crafts Movement in the late 19th century amongst others. She also covers the benefits of using local materials rather than the unsustainable textile methods used around the world which create fast fabric at huge environmental and human costs. Working seasonally is also mentioned, especially if the reader wants to use (and possibly grow) plants for natural dye techniques. Given the above, it’s not surprising that she suggests starting each project by looking around your home to see what you already have. Consider repurposing textiles, possibly mixing old (even damaged) fabrics with new ones. Buy local if possible, either from small-scale local weavers or from larger-scale manufacturers if you have any in your area. She explains techniques such as bleaching and over-dyeing, including the permanence (or not) of various methods and natural dyes. Sections then follow on preparing the fabric, making sample patches and developing a design. Various traditional techniques are covered, including Kantha, Japanese Boro and decorative mending. There is a suggestion to create a daily stitch journal, using one continuous length of cloth for meditative stitching. Another project is stitch sketching, using walks in the local area to gather ideas. Throughout the book she showcases individual textile artists. It’s an attractive book and a pleasure to read. This is the first book I have read of this sort, and what a great book it is. 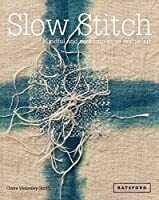 Its very well written, extremely interesting with a nice blend of history and technique and encourages you to have a go at slow stitching and how to go about it. Its really inspired me and I very much recommend it. 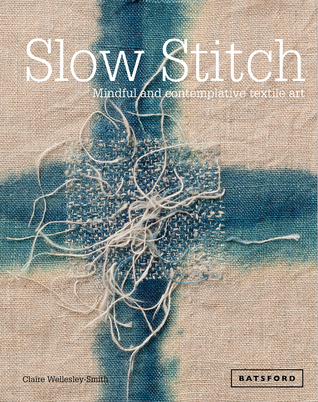 The subtitle of this book tells it all - Mindful and contemplative textile art. There is a current focus on ‘slow stitching’, enjoying the process rather than rushing for a quick end result, using (or re-using) unusual materials, and creating art rather than taking a ‘colour by numbers’ approach to craft. This book gives the reader the history of the slow stitch movement along with materials and techniques to incorporate. Wonderful photos of works are included to enjoy or to try to emulate techniques and stitches. Specific projects are described. There is enough variety to provide something for any stitcher--a nice collection for the needlework aficionado. A beautiful book, wonderfully illustrated with great photographs that pick up and showcase the details of texture and stitch. A thoughtful, reflective and practical book full of inspiration for those interested in a slower and greener practice. Interesting & imaginative but way to chaotic for my crafting....I had to look at it as an artwork book and appreciate what each person has created and the thoughts behind hand stitching as a therapy and a lost tradition and not as a book I would purchase and use as a reference. The slow movement is a movement for all of culture. Food, art, clothing and more. This is a beautiful book. The art portayed uses natural fabrics and simple stitches. I would love to try the natural dyeing techniques as well. Evocative meditation on textile art. Rather than focusing on completing finished products, the author celebrates the process of creation. Do you want to slow down and appreciate the simple act of stitching? This book is full of ideas and inspiration. Inspiring and gorgeous book. Made me think about time, creating for the sake of it and sustainability and the textile industry. A fast read, with gorgeous photos, definitely a shot of inspiration. I have had a wonderful run on excellent needlework books recently. This is but another inspirational book well worth pursuing. For me, a fine introduction to the personal benefits of and reasons for hand stitching, some nice ideas and close photos of work, and some inspiration. This isn't a how-to book, there are no projects, and the resources aren't particularly helpful in the US, but I still found some great ideas, especially around using natural dyes. Lots of new approaches to consider. Sets the mood for mindful work. Useful combo of method and philosophy. Getting ready to read it again from the start. What a neat book, a different perspective on sewing and mindfulness.